“Is this a war declared against Kashmiris who, despite all odds, cast their votes, reaffirming their belief in democracy? Or is this a war declared to serve the electoral interests of a particular political party in the country?” asked senior PDP leader and J&K education minister Altaf Bukhari, in response to BJP leader Ram Madhav's justification of the Army's use of a human shield against stone pelters in Kashmir. Reacting to the development, Madhav had remarked that “everything is fair in love and war”. The education minister's outburst followed PDP vice-president Sartaj Madni's sharp reaction to the state BJP minister Chandar Prakash Ganga's advocacy of the use of bullets against stone-throwers. Madni termed the utterance 'disgusting'. “It is unbecoming of a senior minister in the government to dish out such a sweeping, sickening and intimidating statement against the Kashmiri youth. This reveals a poisonous mindset towards Kashmir,” Madni said in a statement issued immediately after the video of Ganga's statement started circulating on social media. Madni said Ganga's statement was in contravention to the stand of the state cabinet on the issue. The cabinet, in its 18 April meeting in Jammu, expressed deep anguish over the loss of lives in the Valley, and directed the security agencies to exercise maximum restraint while handling law and order situations to prevent the loss of lives. However, the reason for the fresh crisis in the coalition goes beyond Madhav and Ganga's statements. It traces itself to the BJP's snatching of the PDP's council seat after the latter's leader, the MLA from Zanskar, Aga Syed Bakir Hussain Rizvi, voted for the BJP. The BJP legislator who was supposed to vote for the PDP also voted for his own party. This was despite the fact that the PDP had already helped BJP win two of the six vacant Council seats. The PDP was furious, but it hardly mattered to the BJP. Subsequent BJP statements, which advocated a more hardline approach towards Kashmiri protesters, even validating the use of bullets and human shields, only added to the strain. “While Kashmir is confronted with a challenging situation, all that concerns the BJP is how to cheat its ally of a Council seat. It is such petty-minded politics,” said a senior PDP leader, on the condition of anonymity, as he was not authorised to speak on the matter. The leader said the issues between the parties were bigger, and that the Council seat was only one of the triggers. The leader said because of being in coalition with the BJP, the PDP has lost the ground in Valley. In popular perception in the Valley, the coalition has long lost its rationale. 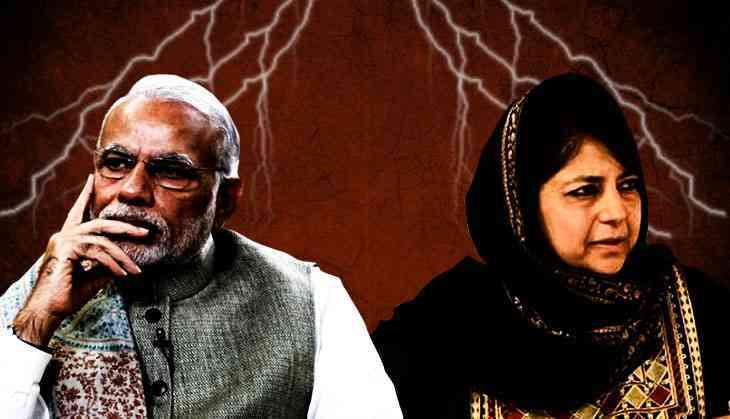 Adding to the PDP's woes is the BJP's bellicose Hindutva-inspired nationalism. While PDP, a putative soft-separatist party, plays up the fact that it stalled the Sangh Parivar's bid to repeal Article 370, the BJP has moved the political discourse on Kashmir away from the resolution of the dispute to the integration of the state into India. The BJP has also reneged on all its commitments, such as the partial revocation of the Armed Forces Special Powers Act, and initiating dialogue with separatist groups. Rising intolerance in the country and the attacks on minorities have been a source of further discomfort. The BJP's Kashmir spokesman, Khalid Jahangir, rubbished the reports that the coalition was headed for a split, even though he agreed there were some problems which were being sorted out. “There are some issues, and both the parties are working on them. One such issue is that the BJP ministers do not visit Kashmir. Now, the party has taken a note of it. The ministers will be visiting the province more often now,” Jahangir told Catch. As for the Council seat, Jahangir blamed it on the PDP's own MLA who switched sides. “Did we know that he (MLA) would not vote for his own party?” he said. However, to address the growing rumblings within the coalition, BJP general secretary Ram Madhav arrived in Jammu on Friday, and held a closed-door meeting with PDP leader and J&K finance minister Haseeb Drabu, at the BJP's Trikuta Nagar office. BJP's J&K in charge, Avinash Rai Khanna, was also part of the meeting. The three leaders are understood to have discussed the differences between their parties, and the need to address them. BJP ministers are reported to have been told to look after the entire state, and not just Jammu. Later, Madhav held meetings with Governor NN Vohra and the Director General of Police, SP Vaid. Now, Chief Minister Mehbooba Mufti is likely to hold a meeting with Prime Minister Narendra Modi in New Delhi to sort out the issues facing the coalition. BJP president Amit Shah is also visiting Jammu for two days from 29 April. “The party president will hold meetings at different levels in the party,” state general secretary (organisation) Ashok Kaul said.